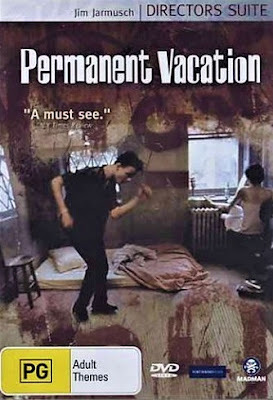 Permanent Vacation (1980): the first completed effort by Jim Jarmusch, a rudimentary one shot on a shoestring budget, telegraphs his future batch of films. I found it interesting and fun, whereas most "regular people" would probably find it aimless and pointless. Permanent Vacation serves partly as a semi-documentary tour of bits of the New York City cityscape in the late 1970s -- shabby and in disarray. Ali (Chris Parker), the main character, would be quite comfortable in 2018 America as a millennial man-child: weird and awkward, without much ambition or drive other than to do whatever he wants without much cash on hand, slightly brain-damaged in his social interactions. He does muster up enough energy to steal a car for $800 in cash -- hardly something to write home about. He seems to drift away from his pseudo-girlfriend after examining the architectural ruins of an area "bombed" by "Chinese" in a some fantasy war where he also happened to stumble on a homeless veteran of the US-Vietnam War. Ali considers seeing a hip film and interacts with a nodding junkie jazz hepcat, with the final scene from Sergio Leone's Il buono, il brutto, il cattivo / The Good, the Bad & the Ugly (1966) playing in the background, just barely audible (one of the strangest touches of the entire movie). Earlier, Ali and his pseudo-girlfriend read from Les Chants de Maldoror / Maldorer's Lay (1868-1869) by Comte de Lautréamont. Permanent Vacation is a prototype of more "fully realized" Jarmusch films, more like Bohemian bits of flash fiction or poems loosely strung together than a longer work.